Communication with you - the player - has always been a challenge for me. This time around, we decided to have a manager feeding you the goal and the rules of the game world through voice-over. 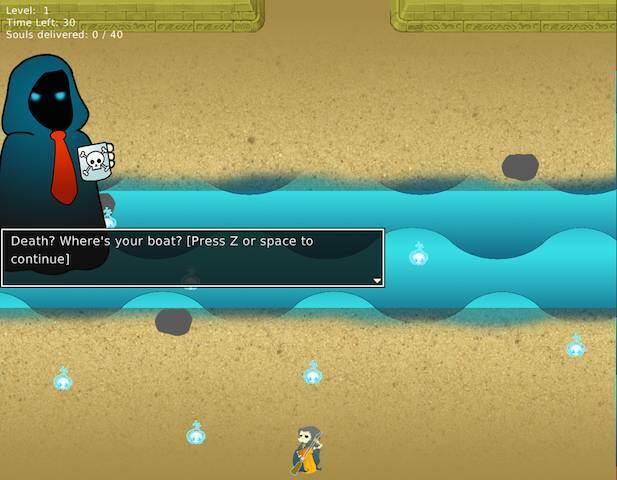 You play as Death, who has somehow lost or broken his boat. Still, your role as metaphysical ferryman cannot wait and you must deliver souls across the Styx using Frogger-like lane navigation. 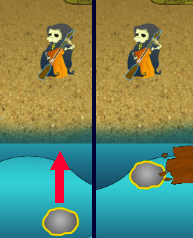 Some of the more obscure mechanics in the game - like moving around special stones that appear in level 5 and using your boat - we explain with dialogue, but I’m not sure whether or not this worked. I found myself playing through the game and getting frustrated by the platform spawning and had to step back and remind myself that I could move stones to my advantage. The game became much less frustrating after employing a little underworld magic. Other mechanics went completely unexplained as I tried to estimate player assumptions. The number of souls you can move around is limited. Nobody tells you that, but the player should be able to see that after they have 3 souls following them no more will join. Additionally, a red soul appears each level beyond the first - also unexplained. Each red soul you collect increases the number of souls you can lead at once. I’m not sure if the clarity added by explaining this in the game would outweigh the mystery of not doing so. It makes me think of the film concept of “respecting the audience.” Essentially, spelling everything out for your viewers/players insults their intelligence. Of course, players are in the position of making choices so they need to have enough information to make them fairly. So did this cross a line? Maybe. 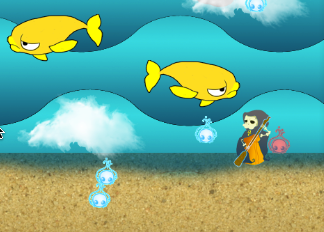 A player might spend some time trying to get a fourth soul when they can’t actually add them to their merry band. Hopefully they’d learn from that experience, and the cost of failing to know their soul limit is just a detour. Teaching the player about moving rocks would have been good too, but I’m not sure how I could have forced them to use that knowledge… Also, ahnks = checkpoints for souls. 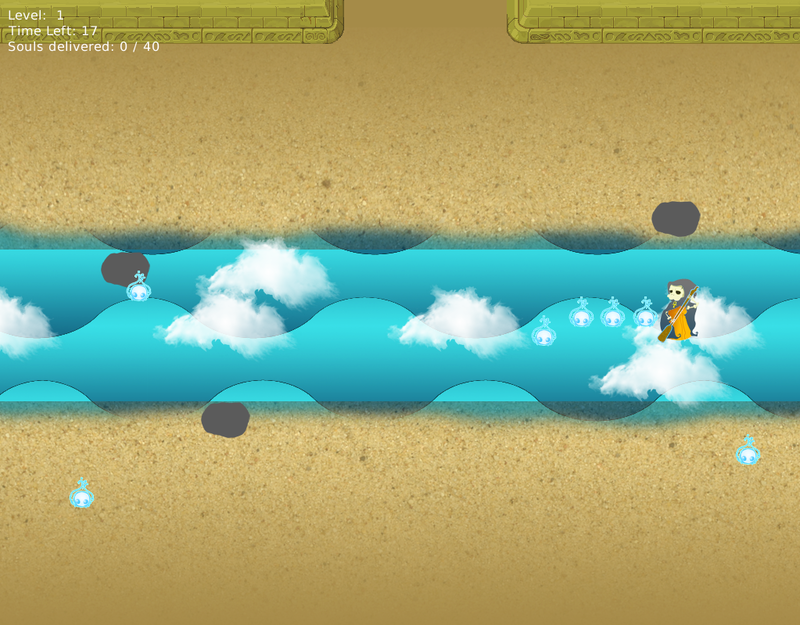 I tried to mix up the frogger gameplay by adding stepping stones to the river that can be used as resting points for the player, and that divert platforms into different lanes. Different sorts of platforms have different behaviors, and they’re introduced one at a time as you progress through the game’s 12 levels. Each level is 30 seconds long, meaning that you need to play at least 6 minutes to complete the game. This may have been too long for the average jammer. Even so, I’m happy to have been able to program a progression system and difficulty ramp, and view the later content as a reward for those diligent enough to stick with the game. Whether or not you’re the patient type, I hope you’ll check out my submission and have some fun!